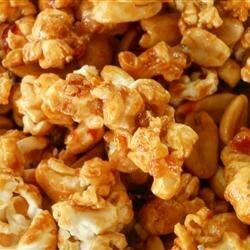 "Crispy, crunchy, sweet, spicy, aromatic, and awesome! You know I'm a fan of the hyperbole, but it's with all sincerity that I say this may be the greatest caramel popcorn-related snack breakthrough since balls." Preheat oven to 250 degrees F (120 degrees C). Line baking sheet with foil brushed with vegetable oil or a silicone baking mat. Heat 1 teaspoon vegetable oil in a large saucepan. Add popcorn; cover and cook, shaking often, until fully popped, about 5 minutes. Transfer popcorn to a large bowl using a strainer or your hands, leaving unpopped kernels in the pan. Stir chopped peanuts into popcorn. Combine brown sugar, 1/4 cup vegetable oil, and corn syrup in a large saucepan over medium heat. Add lime juice and fish sauce. Bring to a boil and cook, stirring occasionally, until thick, about 5 minutes. Remove from heat and quickly stir in sambal oelek, lime zest, and baking soda. Pour brown sugar mixture over popcorn, stirring to coat. Spread popcorn out on the prepared baking sheet. See how to make this sensational, sweet and spicy snack! While an interesting treat, I found that it burned easily when using a foil lined tray. I had much better results using a tray lined with a silicone mat. Crazy good! Didn't change a thing.